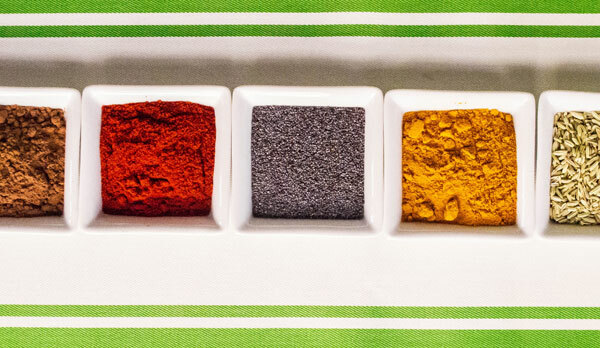 Spring has arrived, and if your spice cabinet is a little too crowded then it might be time to clean it up. Katie Barszcz, a personal chef, of The Small Boston Kitchen shares her tips to not only revive your spice cabinet, but also cook some delicious recipes after you are done! The other day I was at my parents’ house rummaging around in their spice cabinet, looking for something to add to a soup that I was making, when I noticed that their spice cabinet is pretty vast, and mostly filled with full bottles of spices that appear to be well past their prime. Shortly afterwards, I was teaching a group cooking class and, while talking about spices, the conversation revealed that most people in the room had a similar problem – a large cabinet full of spices purchased for one specific recipe, not much knowledge of what else to do with it, and an uncertainty of whether or not it was even good anymore. I suspect that my parents and the students in my class are not alone with this conundrum and while it’s an easy solution to say that a “spring cleaning” is in order, the solution gets more complicated when you don’t know where to start. So, let’s simplify things and take it from the beginning, shall we? First, take everything out of your spice cabinet and use a damp cloth to wipe away any dinginess. Next, since arguably one of the most important elements to great cooking is starting out with the freshest products available, you’ll want to examine your spices. 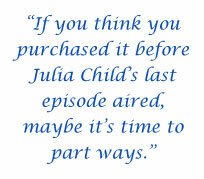 If you think you purchased it before Julia Child’s last episode aired, maybe it’s time to part ways. If you aren’t sure, just give it a good sniff. Does it have a fresh aroma to it? If you’re taking a whiff of some fennel and it doesn’t smell like much, toss it. Does that cumin have a nice, earthy smell to it? Put it aside in a “keep” pile. If you come to a spice that naturally doesn’t have much of an aroma to it fret not, there are other ways to tell if the spice is past its prime. Turmeric, for example, doesn’t offer much by way of the smell department but it does have a nice deeply vibrant yellow hue to it when it’s fresh. If yours is looking a little dull, it’s time to move on. 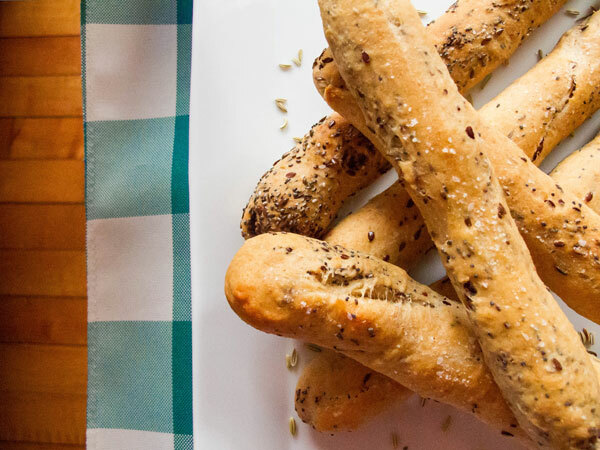 Katie shares her recipe for fennel-poppy seed breadsticks with sea salt that you can make with leftover spices after you purge. Now, if you want to take this project one step further, you could write down all of the spices in your cabinet and make a note as you toss them so you’ll know what to replace. Additionally, as you’re sifting through your spices and you come across that 5 Spice Powder that you used once for a stir-fry recipe last month, make another little note to yourself to research it a bit to see what else it’s capable of. It’s also a good idea to keep your list so that you’ll have a clear idea of what you already have on hand and what you’ll need to pick up next time you’re at the store. And since we’re talking about shopping for spices, allow me to share a tip: always buy your spices whole and then grind them on your own. I usually find a coffee grinder works well for this task. Buying spices whole will help give them a little staying power. At this point, you may be wondering why I haven’t mentioned any dried herbs. True, you can find just about any herb in a dried form, but I discourage their use. While it may work in a rub for meats or poultry, you’ll never truly infuse all of the beauty of an herb into your food by using it in its dried form – fresh is always better. But, if this philosophy isn’t for you, that’s okay too, just sort through your herbs the same way you sorted through the spices, smelling them and examining their color. You’re still looking for a vibrant scent and brighter colors. Dull, grey and brittle herbs should be kicked to the curb. 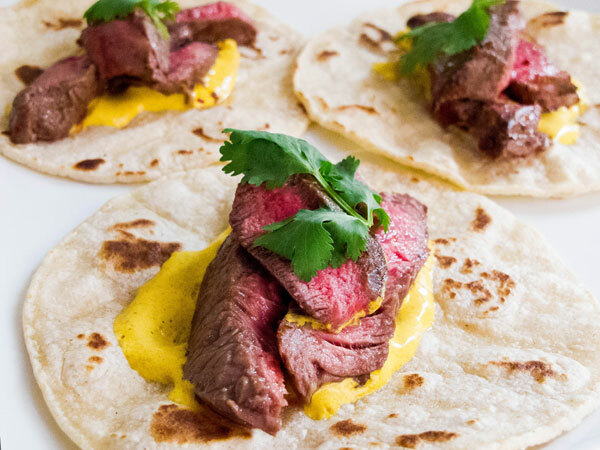 Once you have only your fresh spices left, you can make Katie's cumin-rubbed steak tacos. Once you’ve successfully sorted through your cabinet spice by spice, it’s time to organize them. If you’re of the type A persona, maybe alphabetizing them makes the most sense to you. Or, perhaps keeping the hot spices in one area and regular ones that you use regularly in another area makes more sense to you. Really, it’s all a matter of preference and what you’re most comfortable with. I do, however, suggest that your spices all remain visible and easy to reach; otherwise they’re easier to forget. Some experts will suggest that every six months you follow a routine similar to the one I’ve outlined (the theory being that after six months of purchase, the potency of your spices will decrease). But I’m not sure I buy into that. I think that this timeframe is a little unrealistic in today’s day and age and instead, think you’ll be in good shape if you perform this ritual once a year. And, to help make sure your spices are performing at their peak, you can always give them a wake-up to help them release their oils. To do this: place the dried spices into a skillet and toast them on medium-high heat for a couple of minutes, until they become fragrant. It’s a quick little steps that you can easily do to make your spices more powerful and pronounced. I make a habit out of doing this trick virtually every time I use dried spices. If I’m going put all of that effort into making something, why not make it the best it can be? 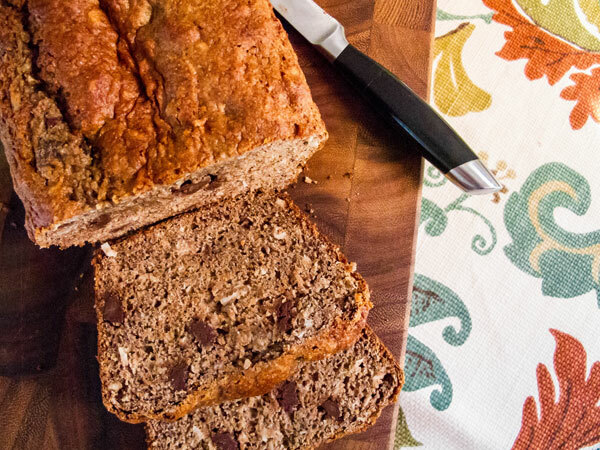 This banana bread recipe features ground allspice and ginger for extra flavor. Hopefully this little journey through your spice cabinet has got you thinking about them and got you inspired to use those that might not get as much love. Here, I’ve compiled a couple of my favorite recipes utilizing some common spice cabinet residents that might be looking for a new and creative use. Katie Barszcz had been creating recipes in her The Small Boston Kitchen since 2009 when she realized that in the kitchen was where she was happiest. In January 2011, she gave up her corporate job to enroll in culinary school. She is now the co-owner of the The Skinny Beet, a personal chef and catering service serving the Greater Boston area and her writing and photography have been featured in Boston.com, Boston Magazine, The Kitchn, Eater Boston and Boston Public Radio Kitchen.